The remarkable success of 13-year-old Helen Shapiro in 1961 sparked a new trend in British pop. In her wake, numerous precociously talented schoolgirls landed recording contracts, but none could match the chart success of Helen. 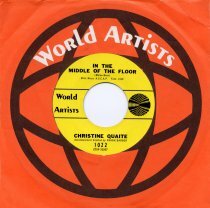 Christine Quaite, who released a series of strong recordings in the first half of the decade, was one of the best. Christine was born in Leeds, Yorkshire on May 11th, 1948. Her grandfather and uncle were both professional dancers, but they didn't influence her musically. She began singing when she entered a seaside talent contest in the Yorkshire resort of Bridlington at the age of eight. She went on to enter countless similar competitions and to sing at many charity shows. It was fun and she enjoyed it. "We used to put on a show for the kids every couple of weeks. Paul Conway was the pianist and lead musician, Christine was one of the singers and I used to direct the shows. We used to take the current hits and present them in that week's show. At one time Christine asked me why we couldn't do an original song as well, and I answered somewhat sarcastically, 'Sure, I'll go and write something.' I didn't actually mean it, but the idea must have stuck at the back of my mind, as I came up with the lyrics and a rough idea of the music. As I am not a musician, I approached Paul, who polished it up, wrote it down musically; we then gave it to Christine to sing. 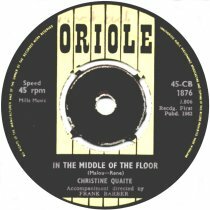 About a year later, Christine entered a competition and came in second, receiving a recording contract from Oriole Records. She contacted me to say that they had got the A-side, but would we agree to 'Our Last Chance' being the B-side." 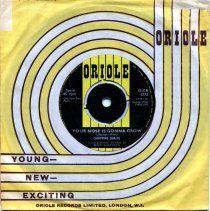 The singing competition was in Manchester and Oriole was a small, independent record label in London, famous for hits such as 'Like I Do' by Maureen Evans and for being the first company to push Motown records in the UK. Christine was only 13 at the time, but her powerful voice belied her tender years. 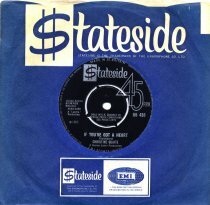 Her first record - 'Oh My' b/w 'Guilty Eyes' - came out in 1962. 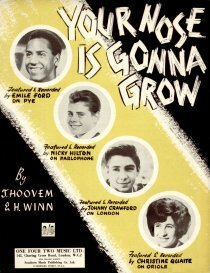 The home-grown 'Our Last Chance' was issued on the B-side of her second record, one of numerous British cover versions of Johnny Crawford's US hit 'Your Nose Is Gonna Grow'. 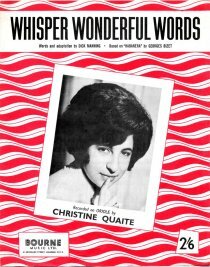 Christine's third single, 'Whisper Wonderful Words', used the trick of "borrowing" a classical tune, in this case Bizet's 'Habanera' from 'Carmen' - you'll recognize it when you hear it! Being a recording artist in her early teens, Christine's life was full of problems. She hated school, being much more interested in singing, tenpin bowling, buying clothes and watching football: Leeds United, of course. Her school would never allow her time off, leaving only the weekends to do TV or radio. If she was making a record, she simply had to play truant. Christine used to get very excited about the things she was doing, but record followed record with no hit. 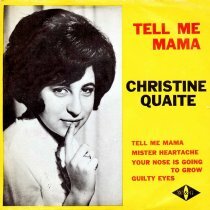 However, some commercial success did come in the USA, where the World Artists label (famous for Chad & Jeremy) released her next single, the catchy 'Tell Me Mama', which reached No.85 on the Billboard charts in May 1964, outselling the original version by well-known American singer Janie Grant. The record ended up getting released all around the world. 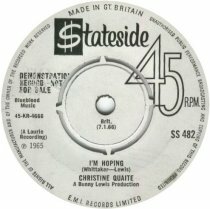 Her next brace of singles - a version of Ellie Greenwich and Jeff Barry's 'Here She Comes' (original version: the Darlettes) and 'Mr Stuck-Up' (which World Artists also released in the States) - were among her strongest, but neither charted. In addition to the six records Christine released on Oriole before her contract expired in 1964, there exists an acetate on the label of 'Huggin' My Pillow', a Crewe-Gaudio song also recorded by the Four Seasons in 1966. 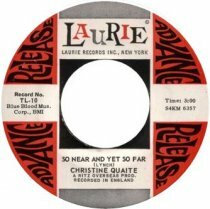 (As Oriole had gone out of business by then, Christine's version must pre-date that release. Perhaps it was the original version?) She continued doing TV, radio and cabaret work around the country, always with the support of her parents. Late in 1964 the family moved to London, to be nearer the action. 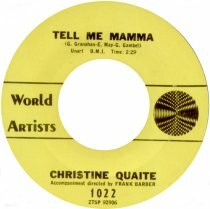 In June 1965 Christine signed with manager-producer- songwriter Bunny Lewis. 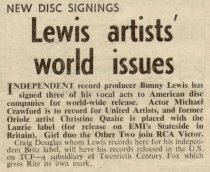 As she had achieved something in America, Lewis' Ritz Productions company inked her to a new recording contract with Laurie Records of New York, in the expectation it would guarantee her further releases there. Her first record under the new deal, 'If You've Got A Heart', was from the pen of Bobby Goldsboro. Like her follow-up, Burt Bacharach & Hal David's 'Long After Tonight Is All Over', this was released in the UK on the Stateside label, an outlet usually reserved for US recordings. This and her earlier hit led some people to assume Christine was American. Ironically, it seems her Stateside singles never did get generally released in the States, although 'If You've Got A Heart' progressed as far as the test pressing stage. 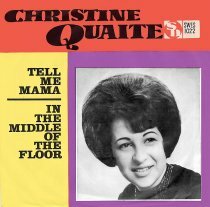 Sadly, these were to be Christine's last releases. 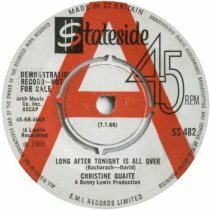 Much later, 'Long After Tonight Is All Over' became a Northern Soul classic in the clubs of Northern England, mainly via the Jimmy Radcliffe original, but Christine's interpretation has been known to changes hands for three figure sums in recent years. It seems very unfair. Malcolm Baumgart, John Black, Howard Earnshaw and Mick Patrick.